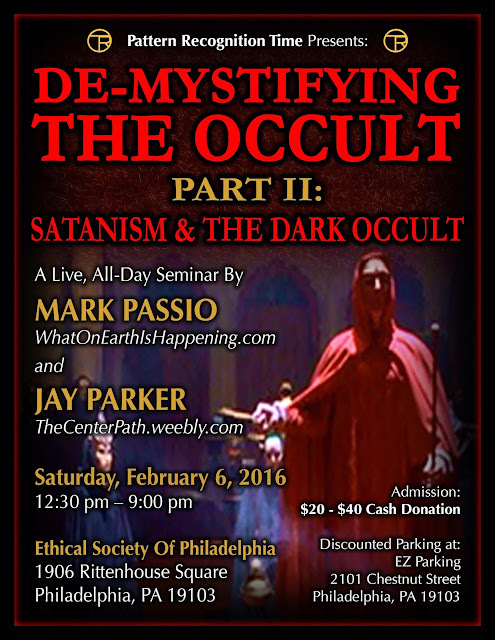 My friend Paul, from A Tree of Light, and I will be driving to Philadelphia to see the Demystifying the Occult Part II by Mark Passio. I'm actually traveling there as I type this. It should be a consciousness expanding presentation. His first was riveting. I am still reviewing part three to learn how to decode symbolism in life, especially fictional works. I won't have time to do in-depth commentary on any articles, but there are several items that I will get out in the coming days. If you are in the area and want to come to the presentation, please do! 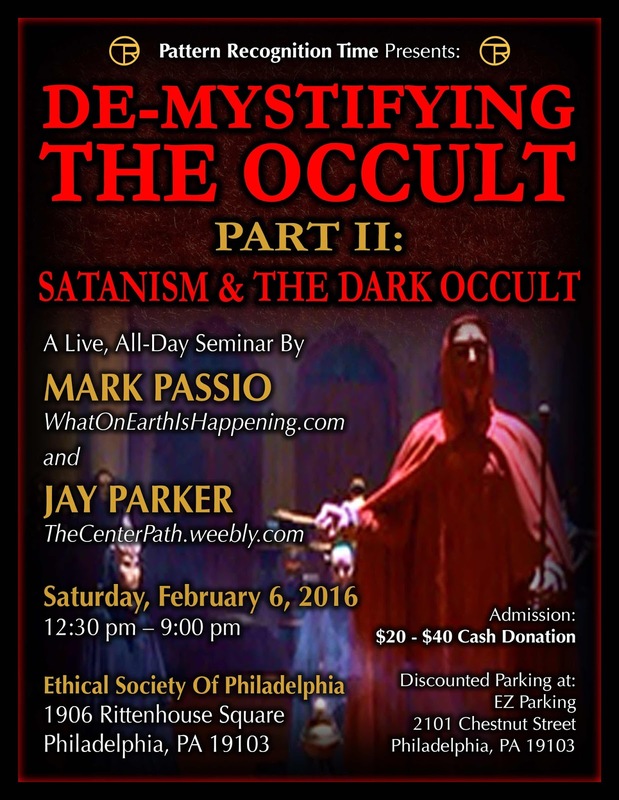 Mark's upcoming seminar: De-Mystifying The Occult Part II: Satanism & The Dark Occult will be hosted by Arthur Capozzi of Pattern Recognition Time on Febraury 6, 2016, from 12:30 pm to 9:00 pm at the Ethical Society of Philadelphia, 1906 Rittenhouse Square, Philadelphia, PA 19103. The seminar will be opened by Free Your Mind conference speaker Jay Parker. $20-$40 cash donation at the door. What IS Satanism? What IS Dark Occultism? How are they employed to control us? How can we defend ourselves against their methods of manipulation? In this seminar, Mark will discuss what Satanism REALLY is, versus what most people BELIEVE it to be. He will outline the basic ideology of Satanism, which is running our society and ruling the entire world. Mark will explain the psychological mindset of Satanism's adherents, which is such an integral part of the continuation of human slavery. Delve into the knowledge of how this Old Religion works to strengthen yourself against it's unholy influence.